Archbishop Burke clarifies the roles of girls and Catholic lay faithful!!! How is the world transformed? 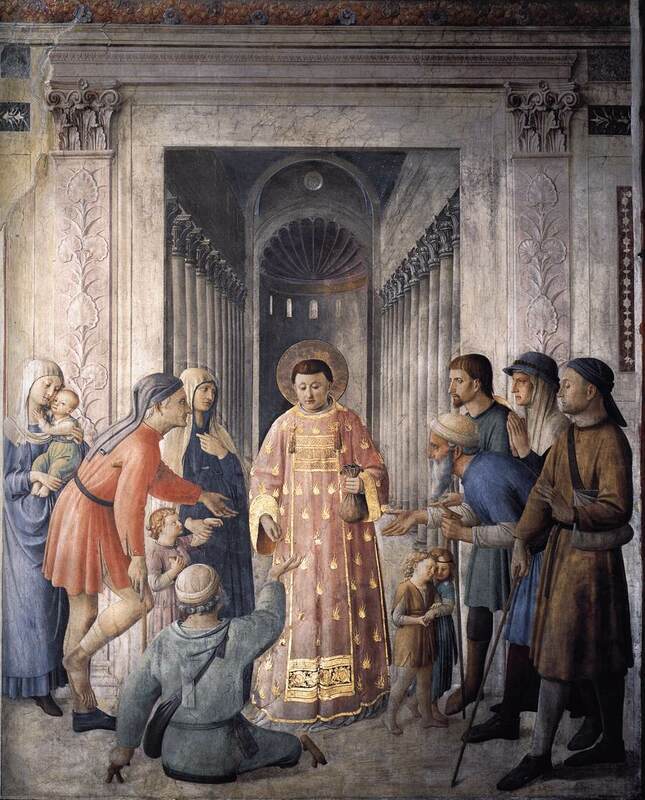 Today, the Feast of St. Lawrence, is also the anniversary of the foundation of the Order of Mercy. On this day, in 1218, in the Cathedral of the Holy Cross, the Order was established, with St. Peter Nolasco, founder and Master General. It is particularly fitting that our foundation is also the Feast of St. Lawrence. 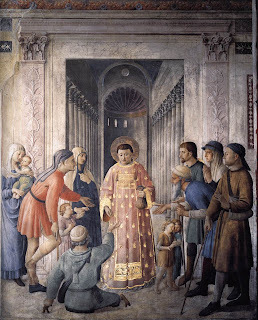 St. Lawrence spent his life at the service of the poor, giving of the Church's treasure to feed them, minister to them, show them the loving heart of Christ. Likewise, our Order has as its essential Mission, to be at the service of the poor -- those held captive by the Devil and "other enemies of our Law". Historically, our friars would even sell sacred vestments and vessels, to raise money to ransom souls back from captivity. Today, we begin the 793rd year of mission and ransoming in the world. The world is still far from being saved and is in need of that true ransoming. We, the Mercedarians, called by God to manifest the Redemptive Mission in the world continue the same work, in the authentic spirit of our Father and Founder, St. Peter Nolasco. After fifteen years of admirable mercy in the redemption of Christian captives, Peter Nolasco and his friends were seeing with concern that, instead of decreasing, day by day the number of captives was growing excessively. Our determined leader, with a strong personality, clear ideas, a strong faith, a solid and balanced devotion to Christ and to his Blessed Mother, a compassionate heart, a serene and resolute trust in God, Peter Nolasco did not feel overwhelmed by the magnitude of the mission undertaken and his own insignificance. 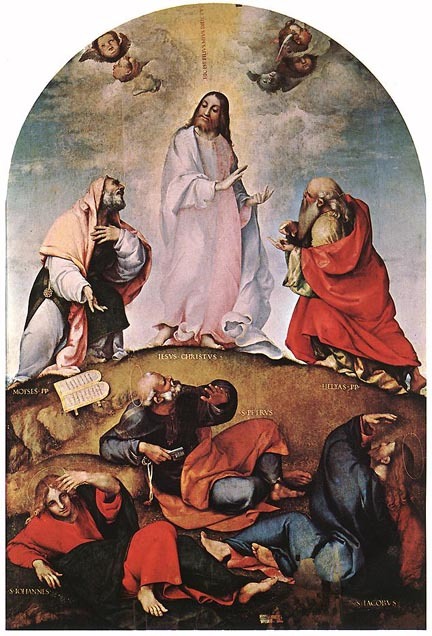 In his fervent prayer, he sought divine inspiration to be able to continue God’s work which he had started. At that point and in these circumstances, during the night of August 1, 1218, a special intervention of Blessed Mary occurred in Peter Nolasco’s life: an amazing Marian experience which illumined his mind and stirred up his will to transform his group of lay redeemers into a Redemptive Religious Order which, with the Church’s approbation and the protection of the king of Aragon, would pursue the great work of mercy which had started. On the next day, Peter Nolasco went to the royal palace to explain his project to young King James I and his advisers, the first of whom was the Bishop of Barcelona, don Berenguer de Palou. Peter’s plan, inspired by God through Mary, was to establish a well-structured and stable Redemptive Religious Order under the patronage of Blessed Mary. The proposal pleased the king and his advisers since, after the failed attempt by Alfonso II with the Order of the Holy Redeemer which did not prosper, the noble aspiration of the royal house of Aragon to have its own redemptive order was becoming a reality. For his part, King James I the Conqueror established the Order as an institution recognized by the civil law of his kingdom. In the very act of the foundation and as an important rite of the ceremony, the monarch gave the Mercedarian friars the habit which, in the language of military orders, is the shield with four red stripes over a gold background, that is to say, the sign of the king himself. Along with the cross of the cathedral, this emblem would form the Order’s own shield. On that memorable day, James I endowed the Order, of which he considered himself the founder, with the Hospital of Saint Eulalia which served as the first Mercedarian convent and as a house of welcome for redeemed captives. In the proem of the first Constitutions of the Mercedarian Order of 1272, three very important elements referring to the foundation stand out: the name, the founder and the purpose of the Order. The name with which the Order founded by Peter Nolasco is identified, is mentioned first. Prior to the 1272 Constitutions, the Order had several names among which: Order of Saint Eulalia, Order of the Mercy of Captives, Order of the Redemption of Captives, Order of Mercy. But the proper and definitive title is: Order of the Virgin Mary of Mercy of the Redemption of Captives. Then it is stated that Brother Peter Nolasco has been constituted “servant, messenger, founder and promoter” of the new Institute. Peter Nolasco is the real founder of the Order or the “Procurator of the alms of captives” as defined on March 28, 1219, by the first document referring to him after the foundation. All these valuable and reliable historical details of the foundation of the Order of Mercy are gathered in the letter of January 11, 1358, sent by King Peter IV the Ceremonious to Pope Innocent VI and kept to this day in the Archives of the Aragon Crown, a reliable guarantee of all the Mercedarian history of the first centuries. 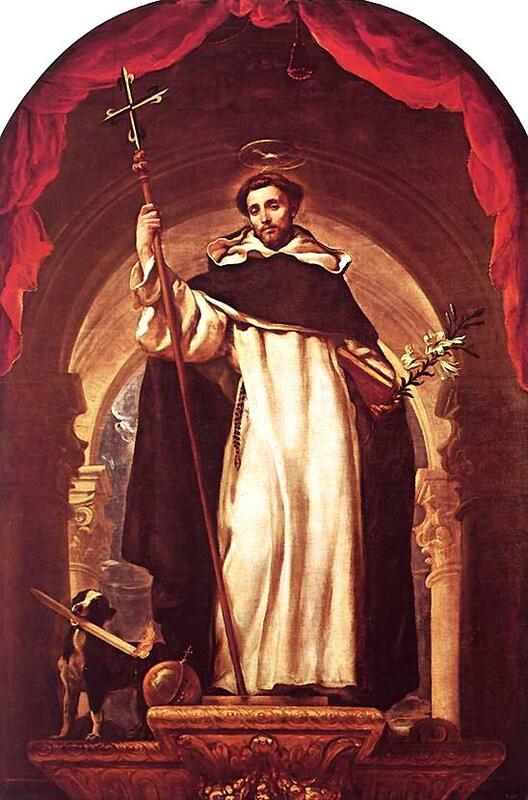 The first friars who received the white habit of Holy Mary of Mercy with Peter Nolasco may have been laymen. Peter Nolasco was not a priest. There is, however, the possibility that on the day of the foundation, there may have been a priest present to serve as chaplain. From the lieutenants designated by Brother Peter Nolasco, we can make up the list of those who donned the Mercedarian habit with him on the day of the foundation: Brother Pascual of Perpignan, Brother Juan de Laers, Brother Bernardo de Corbaria, Brother Guillermo de Bas, Brother Juan de Verdera, Brother Bertrando, Brother Bernardo de Cassoles and Brother Carbó de Llagostera. 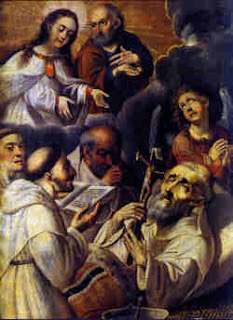 With the solemn and official support of the Church and of the state, Peter Nolasco and his friars, constituted as a Redemptive Religious Order of lay brothers, gained new energy and, with renewed fervor, they continued their peregrinations of charity to collect alms for the redemption of captives in Saracen lands. Two of our Brothers -- Br. Daniel and Br. David -- attended the 10th annual FEST in the Diocese of Cleveland. It was a remarkable experience that was truly a work of the Spirit. Thousands and thousands of families and young adults gathered from all across the Diocese and the State to enjoy fellowship and communion with another. 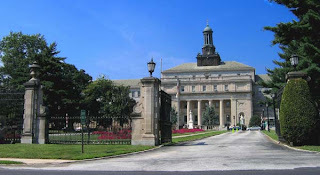 The event had a number of religious communities from Philadelphia, Cleveland, Youngstown, Toledo, Chicago, and from other parts of the country. Our brothers were able to meet many new fellow religious, begin new friendships and build connections with others. GOD BLESS the workers, organizers, volunteers, musicians, sponsors, prayer-warriors, and attendees at the FEST!!!! Today, Happy Feast to all. It is a remarkable and joyous day for the Archdiocese of Philadelphia, where two sons, will be raised to the episcopate. We congratulate and spiritually unite ourselves and our prayers for the intentions of Their Excellencies, Bishop John McIntyre and Bishop Michael Fitzgerald (who was one of this blogger's professors @ the seminary). We also spiritually unite ourselves with our brothers in Philadelphia, who will attend this spectacular and grace-filled event. Major news out of Rome this morning for the Stateside church, especially its religious men and women -- against the backdrop of the controversial Apostolic Visitation of the nation's communities of women, an American cleric has been named to the #2 post of the Vatican office overseeing the global church's million-strong professed members. 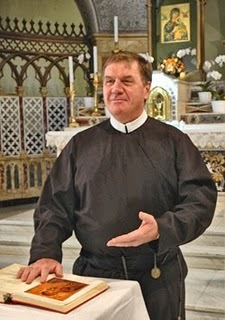 At Roman Noon, the Pope appointed Redemptorist Fr Joseph Tobin, 58, as Secretary of the Congregation for Institutes of Consecrated Life and Societies of Apostolic Life (CICLSAL). With the move, the Detroit native and two-term head (1997-2009) of the community founded by St Alphonsus Liguori becomes an archbishop. Tobin is the second US cleric to hold the post -- in 1969, Holy Cross Fr Edward Heston, an Ohio native, was named archbishop-secretary of the "Congregation for Religious," as it's still widely known. In the years since, the dicastery's last American in a superior-level post was then-Msgr Joseph Galante, who served as its #3 from 1987-92, when he was named an auxiliary bishop of San Antonio; a River City native, Galante currently heads South Jersey's 560,000-member diocese of Camden. Professed in 1976 and ordained two years later, the archbishop-elect's early ministry was spent pastoring inner-city parishes in Detroit and Chicago. "Beyond fluent" in Spanish -- along with Italian, French, Portuguese and "dabbling" in several others -- the experience was said to have birthed a bond with the poor which, during his generalate, saw Tobin urge his 6,000 confreres to keep the care of the marginalized at the core of their work. Following his 1997 election in the footsteps of St Alphonsus, the new Secretary's regard among his colleagues was evidenced in Tobin's election as vice-president of the Union of Superiors General, the umbrella group for the heads of mens' communities, which brought him into close collaboration with the Curial Congregation he'll soon help lead. A veteran of no less than five Synods of Bishops, after serving the maximum 12-year mandate at the helm of the Reds' Motherhouse on Via Merulana and handing over the community's reins at last year's General Chapter, in late May Tobin's enduring favor in Vatican circles was further underscored when he was named to oversee the professed mens' portion of the forthcoming Apostolic Visitation of the church in Ireland, which is reportedly slated to get underway come September. Ultimately, though, the move is a clear commentary on the difficulties the Holy See has faced in carrying out another Visitation: the much-maligned investigation of the nation's 300-plus womens' institutes engaged in apostolic work in the world. With the process now in the midst of site visits to selected communities and slated to wrap late next year, Tobin's appointment indicates a Vatican push for a smooth close to the years-long study by placing an American sensibility at the helm, all the more in the form of a choice well-known as "a pastor" who's earned high marks for working in a conciliatory, collegial style. In his new post, the archbishop-elect will serve as deputy to the womens' Visitation's chief advocate and overseer, Slovenian Cardinal Franc Rodé CM, who reached the retirement age of 75 last September. Tobin becomes the second US religious named a major superior in the Curia within the last year; the other is Archbishop J. Augustine DiNoia OP, the longtime #3 to Cardinals Joseph Ratzinger and William Levada at the Congregation for the Doctrine of the Faith, who B16 tapped as Secretary of the Congregation for Divine Worship and the Discipline of the Sacraments last summer. As of this writing, plans for Tobin's ordination to the episcopacy remain to be determined -- normally, the archbishop-secretaries of the powerful nine congregations that oversee the church's internal life are raised to the episcopacy by their new boss at a rite in Rome. Lastly, especially given its confluence with the Vatican's "dead season" of August, the timing is conspicuous on two accounts: first, yesterday was the feast of the Redemptorist founder. Second, this week sees the annual assembly of the Conference of Major Superiors of Men -- the American church's leadership caucus of male religious -- which is meeting this year in Long Beach. Tobin is en route to the CMSM gathering, where he was already slated to speak. Likewise of keen significance, the assembly's keynote will be given by the nation's senior male religious -- the president of the US Conference of Catholic Bishops, Cardinal Francis George of Chicago, an Oblate of Mary Immaculate. This Scapular was given by the Blessed Virgin Mary to St. Peter Nolasco on Aug. 2, 1218, for the redemption of captive Christians. Our Lady's request was for the establishment of an order for the ransoming of Christian slaves. King James II insisted that the shield of Aragon be placed on the scapular. Our Lady of Ransom is a Marian title commemorating the foundation of the Mercedarian religious order by St. Peter Nolasco in 1218. This name derives from the Spanish word for mercy:The complete name of this order is: the Order of the Blessed Virgin Mary of Mercy -- Ordine di Nostra Signora della. St. Peter Nolasco founded the order in response to a request made by the Blessed Virgin during an apparition. The Friars of this order took a special 4th vow to act as hostages, if necessary, to free Christian captives whose faith was in danger from the Moors. This was important at the time of the Crusades, but has since been adapted to changing historical circumstances. The Mercedarians in Barcelona once commemorated this apparition on the first Sunday after September 24. 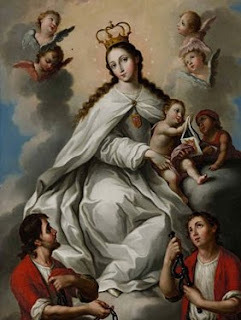 Our Lady of Ransom is the principal Patroness of Barcelona. In 1696, the feast of Our Lady of Ransom was placed on the calendar for the entire Latin Church to be celebrated on September 24. The name for the Marian commemoration on September 24 was changed to Our Lady of Mercy after Vatican II.